“There’s a live virus vaccine that can prevent shingles and its been studied in tens of thousands of people and it works very well, but anybody with an autoimmune disease who is on anti-TNF or other biologic therapies are not supposed to get this vaccine,” says lead author Dr. Jeffrey R. Curtis of the University of Alabama at Birmingham. He says researchers worried that exposing people with weakened immunity to a live virus could result in actually infecting them rather than preventing them from getting sick. But Curtis says that really was a "theoretical concern." Imagine a skin disease that begins with burning, itching, or tingling and progresses to a blotchy rash that erupts with blisters and can produce a sensation where anything that brushes against your skin produces unbearable, intense pain. That’s how the pain of having shingles has been described. Shingles is caused by varicella zoster virus - the same virus that causes chickenpox. Anybody who has had chickenpox is susceptible to developing shingles because the virus remains in the nerve cells of the body after the chickenpox clears, and can later reactivate as shingles. Curtis and his team analyzed data for 463,541 Medicare beneficiaries age 60 and older who had rheumatoid arthritis, psoriasis, psoriatic arthritis, ankylosing spondylitis or inflammatory bowel disease. Of them, 18,683 patients received the shingles vaccine during the study period, which was from January 2006 through December 2009. Out of that population, 633 patients had been treated with biologics. However none of those 633 patients developed shingles within the 42-day period after the vaccination, which is when shingles would be expected to develop. One hundred thirty-eight of these patients did gone to develop shingles, but only after the 42-day period. Curtis says that is due to the overall effectiveness of the vaccine, which has been shown to be about 40 to 50% effective. He also says this study's findings on effectiveness are comparable to what larger studies have revealed about the shingles vaccine. How is that people who were exposed to biologics, got the shingles vaccine, despite the warning about contraindications? Probably because many people can get vaccines at large chain pharmacies without a prescription, Curtis said. It's possible that pharmacies didn't carefully screen some customers, or patients didn't reveal all the drugs they were being treated with. Either way, this offered researchers a window of opportunity to study the effect of the shingles vaccine on people who had been treated with these immune-suppressing drugs. Curtis doesn’t expect these trial results to be practice-changing or change the current recommendations for the shingles vaccine. But he does hope these findings will prompt future clinical trials that can include prospective, randomized, placebo controlled study of the vaccine among this particular population and perhaps reveal practice-changing results. Next entry »Iraq vet says adversity will come - be ready! My Aunt got shingles in her mid 50's Can't younger people get it, like midlifers, before 60? Just to be safe? Like at age 50? I got shingles at age 45 probably because of years of stress from caring for my alzheimer's stricken mother. It caught me off guard because I thought I was too young! It was extremely painful but eventually healed after a few weeks. I do NOT want to go through that again but I heard that you can have more than one episode. Hi, I'm 37 and have suffered with shingles for over 5 years now. I am completely frustrated with the lack of answers as to why I can not be vaccinated. The closest answer I got was that there wasn't enough information about younger people getting the vaccine. Living with shingles is extremely hard. I am a young woman who has shingles on her face. When I suffer a breakout my eye starts to swell shut, my ear has a incredible sharp shooting pain and at times my throat will swell making eating difficult. People treat you (doctors too) like you are a unholy infectious thing. The self esteem takes a big slap at times. The medication I take every day is expensive. At this time with what little information I have I am willing to take my chances with a small hope that a vaccine might help. It honestly couldn't get any worst. Please can you provide a clear answer as to why I (at the age of 37) can't (or shouldn't) get the vaccine. 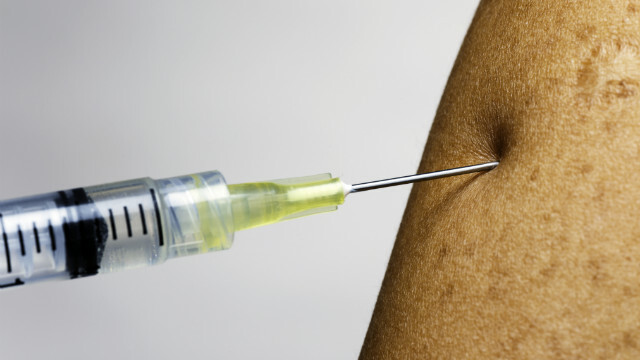 I had a flu shot on 11/28/2012, how long should I wait to get a shingle shot? I'm doing some research and this article has helped me very much. Thank you so much for writing it.